It's very rare that I review apps and services that are not free. However, I found out about it's learning last month and was able to see a demo and I really liked it as a course management system. it's learning is a web-based system containing course management tools that enable students and teachers to create multimedia learning experiences. You can create your own content or merge free and commercial content into the library. 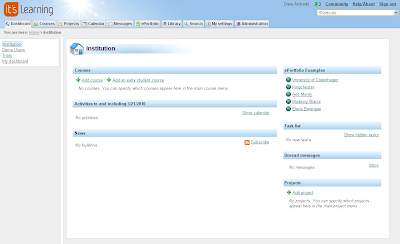 You start with a dashboard that contains links to your courses, calendar, tasks, messages and more. The system is easy to navigate and quite intuitive. Features include: course listings, project management, calendar, messaging, ePortfolio's, a library of lesson plans, full search, a community forum, tasks, blogs, built-in audio and video recorders, plagiarism control and much more. it's learning is a very good alternative to other course management systems like Blackboard or Moodle. I found it to be easier to navigate and use also. it’s learning is not adapted in any specific pedagogical direction. We supply the tools that are used to build up courses, while the teachers and schools fill the learning platform with content. it’s learning supports learning activity, new learning forms and simple access to knowledge. We support standardised e-learning standards such as AICC, IMS and SCORM. User-friendliness is an important factor for successfully implementing a learning platform, whether in private or the public sector, or in an educational institution. Even if different e-learning systems often seem to include the same functions and tools, it is the intuitiveness of the user interface that in practice decides if the learning platform is actually used. When our customers choose it’s learning, it is most often because of the user-friendliness. it’s learning has a number of built-in learning tools. The application can easily be set up so that only parts of these tools are made available for the users of the learning platform. This is an arena in which the participants cooperate, both synchronously and asynchronously. Available tools for communication and cooperation are, for example: the internal message system, e-mail, discussions,process-oriented documents, bulletin boards and news services. it’s learning is also an administrative tool, both for system administrators, course administrators and teachers. The idea behind the learning platform is that the teachers themselves have the flexibility to choose their own methodology in their educational work. Teachers are not dependent on a superior administrator to set up and administrate their learners and content resources. Reports are automatically generated providing overviews of the learning process, either of a single learner or that of a group. it’s learning also supports assessment portfolio evaluation, and provides possibilities for individual follow-up and reflection. it’s learning is a powerful tool for production, organisation, updating and re-use of learning resources. We allow both internal and external tools for producing content. Our users are interested in content production. By using the Add function in it’s learning, you can access about 15 different tools that allow you to add your own learning tools and organise them within a subject. You can organise course content in many different ways, for example, thematically, chronologically and functionally. For the more advanced users we recommend the additional module Library. The Library allows teachers to create and share lessons. Our customers can also make their own learning tools by means of the proxy tool function.